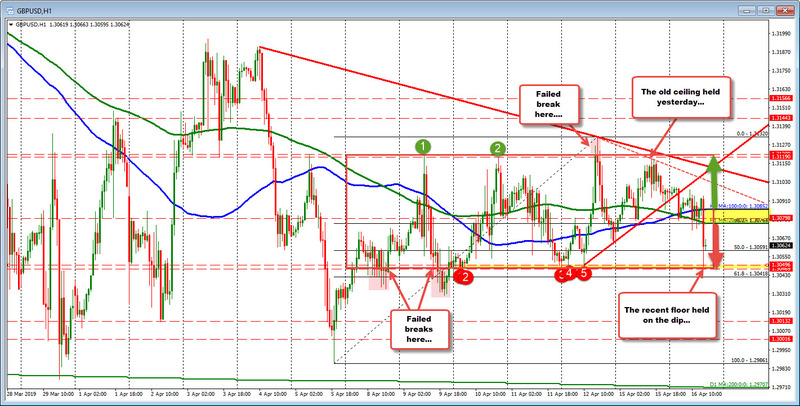 GBPUSD stalls at a floor area. Bounces, but the sellers are more in control. The GBPUSD fell on headline news in the NY session, that the talks were breaking down for a Brexit agreement between PM May and Labour. The price fell but technical traders stalled the fall at recent low at the 1.3047 area, and the price bounced. The pair over the last 7 days has spent most of it's time between 1.3120 and 1.3047. There were a couple failed breaks below the low on April 8 and 9, and a failed break above the 1.3120 on April 12. Each failure led to a run the other way. Traders are trading the range....mostly. IN between the extremes of the "red box", sit the 200 and 100 hour MAs (green and blue lines) at 1.3076 and 1.30852 respectively (see yellow area). That area should be another barometer for bulls and bears (although today there has been times they were ignored). THe simple rule is stay below should be more bearish. Move above is more bulllish. We are below those MAs so the bears are more in control (selll on rallies toward them), with a break out of the "red box" the hurdle for the shorts. Then the traders can work on the lows from the failed break.